I had hardly reckoned on some previously unknown Jussi Björling recordings cropping up. The record companies have, over the last few years, plundered radio and other archives sources for anything imaginable. Then along come these tapes and they're in excellent sound quality too. They were recorded in Copenhagen on 15 October 1959 in the then brand new Falkoner Centret – a concert hall with superlative acoustics seating 2000 listeners. The venue was kitted out with state-of-the-art recording equipment, which was employed to record most of what was happening there. The material was then hidden in the archives – until now. 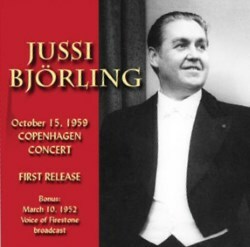 The concert took place less than a year before Jussi Björling’s demise on 9 September 1960. Only a couple of weeks earlier his heart condition made itself felt during the recording of Madama Butterfly in Rome. With this having happened it was expected that he would be in less than top shape but there is little evidence of that here. In a few places his fortes can sound a bit strained but his breath control is as superb as earlier and his legato singing is exemplary. The beauty of his silvery voice is unmistakable – it is the Jussi we know from so many outstanding recordings. The sound quality of the recording is first class and considering the age is clear and dynamic. Seth B. Winner had excellent basic material at his disposal but he has adjusted to take account of some deviations in volume and has also removed disturbing noises like coughs and squeaks. The piano is balanced a mite closer than the voice but this is no drawback. It makes us experience Bertil Bokstedt’s elegant phrasing and exquisite timing. He was a good listener as well as a promoter – the perfect accompanist. We recognise the repertoire. Here are many of the songs Björling recorded in 1952 for the LP Jussi Björling in Song: Brahms`s Die Mainacht, Liszt’s Es muss ein Wunderbares sein, Wolf’s Verborgenheit, Schubert’s Die Forelle and Die böse Farbe, the latter from Die schöne Müllerin and for the umpteenth time one thinks “What a pity he didn’t study the whole song-cycle.” These are songs that were close to his heart and you hear that in the warmth, the insight and the lovable phrasing. The inward, eternally beautifully sung Es muss ein Wunderbares sein gives rise to graceful shudders and the scaled-down final phrases are overwhelming. The Nordic songs are just as dear and agreeable: P-B’s Jungfrun under lind, Alfvén’s Skogen sover, sung with such weightless beauty at pianissimo – don’t wake 'em – Sibelius’ Demanten på marssnön and Säv, säv, susa. Here Bokstedt’s sensitive accompaniment contributes to intensify the mourning song about the unhappy Ingalill who died in the waves. Jussi’s voice trembles from empathy in the final phrase “Waves, waves, lap!”. Grieg’s En svane and En drøm are permeated by a rare intensity. Such a pity he didn't include Alfvén’s setting of Tove Ditlevsen’s Så tag mit hjerte, the only song in Danish in his repertoire and recorded in the studio a good half-year earlier. The music was left on the piano in Jussi’s apartment in Stockholm. Which could hardly have made him very jolly. Of this discord you notice nothing in his singing. As was his wont, Jussi Björling dilutes the song repertoire with some opera arias. Tamino’s first aria from Die Zauberflöte, was his warming-up number, and he always sang Mozart in Swedish. Bizet’s Flower Song was placed between the German and the Nordic songs and it's a song in which he generates a mighty energy. Come un bel di di Maggio from Andrea Chenier was another favourite aria, and again he sings with impeccable legato. What a pity he did neither Don José nor Chenier on stage. Tosti’s Ideale and Richard Strauss’ Zueignung round off this audibly appreciated concert, which we now, after 56 years, can enjoy in excellent sound. There is a substantial bonus as well: The Voice of Firestone from 10 March 1952. It was issued not long ago as a filler for Immortal Performances’ restored Il trovatore from the Met in 1941. The difference with Seth Winner’s transfer is that this has a somewhat stronger out-signal and thus the dynamics are a little wider. Richard Caniell at Immortal Performances cleaned things up a bit and took away a lot of the opening commercials and shortened Hugh James’ announcements. Otherwise one can note that Jussi´s voice seven years earlier was lighter and somewhat freer. He makes the best of Mrs Firestone’s obligatory opening and concluding melodies and Nessun dorma is sung with real glow. Tosti’s L’alba separa salla luce l’ombra - written for Caruso – sounds excellent. Speaks’ Sylvia and Victor Herbert’s Neapolitan Love Song are spoiled by a glutinous chorus – but Jussi sings well. The 24-page-booklet is a further bonus with among other things a detailed historical account by Harald Henrysson of Jussi Björling’s appearances in Denmark. They spanned some 28 years: all of his adult career. It's lavishly illustrated. The vocal expert Stephen Hastings, author of the book The Björling Sound, contributes a profound analysis of the Copenhagen concert, full of insight as usual. There are also contributions by John H. Haley, Dan Shea and Seth B. Winner. This is a quality issue, in other words and should be in every Jussi Björling collection. This CD is dedicated to the memory of Lars Hemmingsson (1939–2015), founder and honorary chairman of the Jussi Björling Society in Sweden, where he was untiringly active until his final illness.